Many of God’s friends have known the dark night of divine absence, when God falls silent and faith loses touch with an answering Presence. Some have understood this as a form of progress, a necessary purgation of comfortable words, images, concepts and feelings as the questing soul goes deeper and deeper into an ungraspable Mystery. Others have experienced God’s silence as nothing but nothingness, a one-way ticket into the void. My God, my God, why have you forsaken me? Ernst Toller (Ethan Hawke) is the middle-aged pastor of an old Dutch Reformed church in upstate New York. The 250-year-old white colonial structure has an interesting history, but its days of relevance are long gone. Almost no one attends Sunday worship, and the building only stays open through the sponsorship of a nearby megachurch, which preserves it as a kind of museum. Tourists stop by now and then for souvenirs, and Toller’s job is to hang around and lend some authenticity to the place, like the costumed actors who re-create the past at popular historic sites. Toller, however, is an ordained minister with a serious vocation. He conducts real worship and counsels his tiny flock. So the inescapable sense of play-acting in a museum is demeaning and demoralizing. His humiliation will be recognizable to all those clergy and congregations left behind by a culture where the biblical God has been rendered harmless––or even unthinkable. Toller, whose very name suggests loss and mourning, lives a lonely, solitary life in a house of monastic bareness. His marriage fell apart long ago, after the death of his son in Iraq. His health is failing, and he is depressed. Prayer comes hard for him, and doubt is his constant companion. His life is a desert with no rain in the forecast. 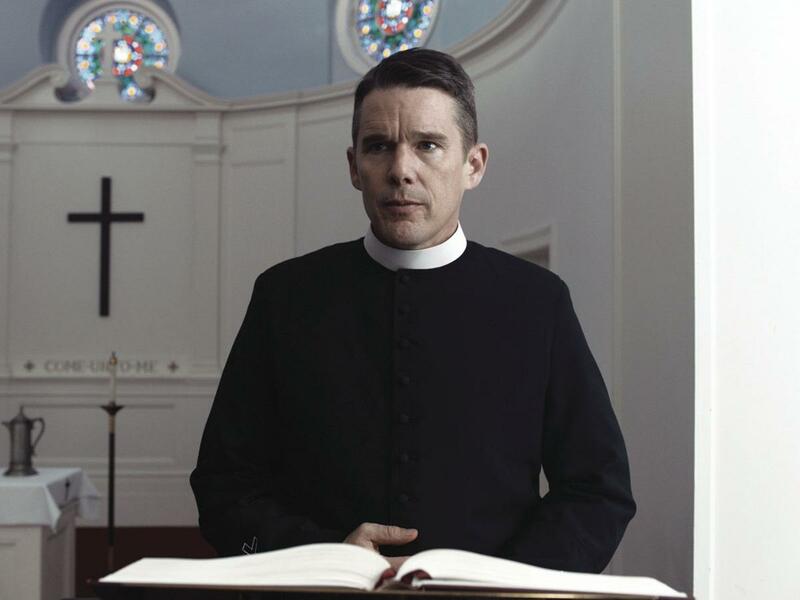 Such a rigorous spirituality may never pack the churches, but it is intriguing that First Reformed has struck a chord with critics and audiences alike. Perhaps this is due to its demanding seriousness, so refreshingly alien to the self-congratulatory spirituality of our time. We grow weary of trivia. We want to fall for something that matters so absolutely. Half a century ago, Paul Schrader wrote a book which had a major impact on film studies. Transcendental Style in Film opened many eyes, including mine, to a different kind of cinema, in which the sacred is expressed not through psychological realism but through a film style fraught with renunciations. No expressive or self-conscious acting presuming to explain the mystery of human beings. No fancy camerawork interpreting a scene or manipulating an audience. 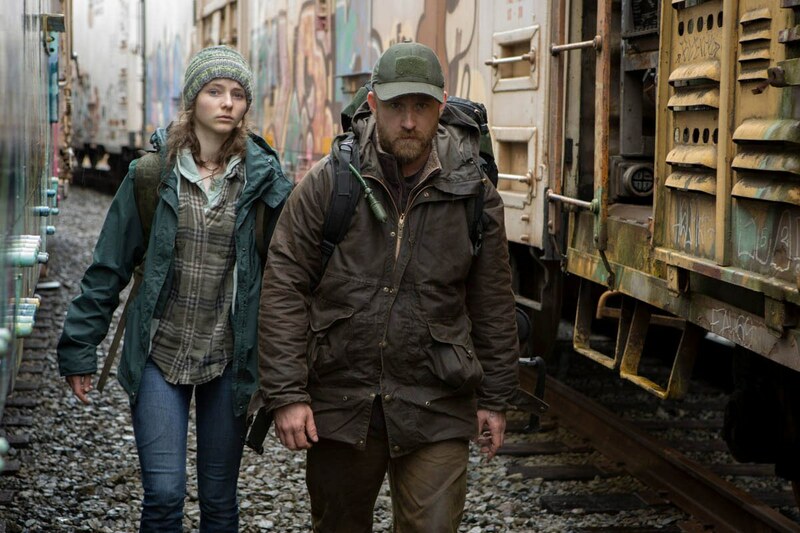 A withholding of many of the emotional satisfactions which moviegoers have come to expect. Transcendental cinema, in Schrader’s view, doesn’t just represent religious experience. It creates it in the viewer. But there are also some crucial differences between the two films. The priest’s only diet is bread and wine, identifying the priest’s suffering with the eucharist. The pastor substitutes whiskey for wine, and pours in some Pepto-Bismol to boot, creating a nauseous parody bereft of holy resonance. The priest is young, innocent and virginal, without a haunting past. The pastor is middle-aged, burned out by an excess of experience, and carrying a burden of grief and loss unknown to the young. Their contrasting faces read like different languages. Claude Laydu, a non-actor whose face suggests an inner life attuned to divine secrets, has the expressive eyes and hieratic features of an icon. When he gazes offscreen, it seems possible he could be glimpsing the hidden God. Hawke’s face is creased, tired, tense and unexpectant; his narrowed eyes give off no light. Bergman’s aging Lutheran pastor, Tomas (the name of Jesus’ doubting disciple), is also in a crisis of faith. He recites the liturgy without conviction, and his pastoral counsel has a patently empty ring. 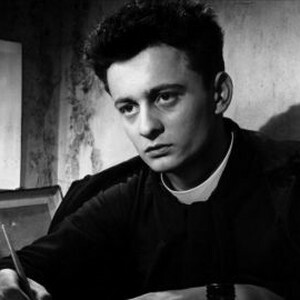 When a parishioner confesses his despair over the prospect of nuclear war (the film was made in 1962), the pastor tells him, “We must trust God.” But then he averts his eyes from the man’s gaze, a “tell” that betrays his own unbelief. After receiving such impotent counsel, the parishioner goes down to the river and shoots himself. Virtually the same incident occurs in First Reformed, but instead of nuclear winter, climate change is the engine of despair. Sickened by statistical forecasts of environmental collapse, a young activist finds no comfort in Toller’s citations from Thomas Merton on facing the abyss with courage. The activist goes out and shoots himself in a snowy wood. In Bergman’s film, Tomas goes even further. In what Wood calls one of the “most painful and ugly . . . in all cinema,” Tomas annihilates Karin’s illusions about their relationship. But strangely, the terrible honesty of this exchange, along with his confession of religious disillusionment in a previous scene, seems to open the possibility for an unexpected grace in which each may discover a kind of salvation in human relationships which an exhausted orthodoxy can no longer provide. Although neither they, nor Bergman himself, have been able to retain the language or vision of inherited belief, the eyes of faith might still perceive in the ending of Winter Light (its Swedish title is The Communicants) a hint of the communion which God never stops desiring, no matter what the rest of us manage to believe. 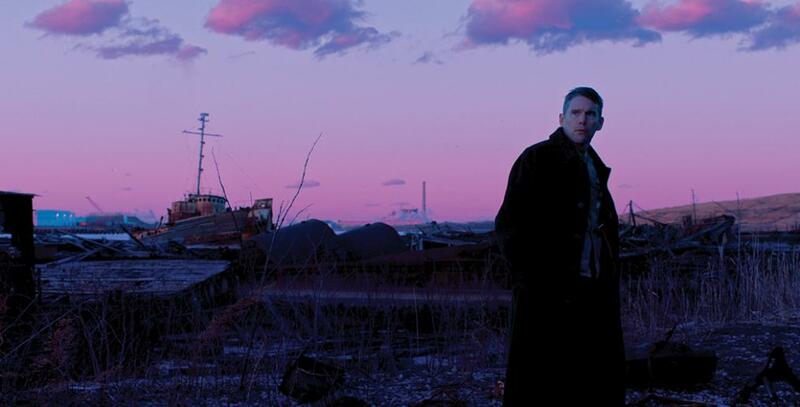 The ending of First Reformed, however, is nothing like the country priest’s trusting departure from this world, nor does it settle for the potential beatitude of purely human relationships suggested by Winter Light. Something extraordinary and redemptive seems to happen in its enigmatic conclusion, but no one can say exactly what. Everybody I know who has watched the film asks the same question: What did you think about that ending? Its highly charged mix of image, symbol, physicality and feeling resists any closure, and Schrader himself has rightly refused to explain it. Critics have applied words like “epiphany” and “catharsis” to the final scene, but have generally avoided discussing it. This reticence respects the viewer’s right to see for oneself, but it also suggests that none of us are sure what to make of it. I share that sense of indecidability regarding the climax, but can’t help thinking about it. In Toller’s troubled mind, the cosmic powers of darkness are sitting in a pew next door. But the viewer is appalled by the pastor’s descent into madness. However evil the acts of men like Balq, equating a suicide vest with the armor of God is abhorrent and wrong. When Toller learns that Mary, the pregnant widow of the dead activist, is inside the church as well, he abruptly scraps his apocalyptic mission. Her life means more to him than his terrible burden of wrath. And her unborn child, like the child of the Nativity, signifies hope for the human future in a fallen world. To put that at risk would be the greater sin. But he still feels compelled to make a dramatic self-sacrificial gesture, turning the violence against himself. His vocation is in tatters, he will probably die of cancer, and the end of humanity may be drawing near. He had once warned the activist about the pride of a certitude that surrenders hope in the face of despair. Now he himself has become a prisoner of that fatal arrogance, confusing his own suffering with Christ’s. He prepares to make his own body a signifier of planetary suicide. He replaces the suicide vest with a coil of barbed wire, wrapping it painfully around his torso in parodic imitation of the crown of thorns. Then he covers his bleeding body with a Christ-like white robe––a vivid image of the paradoxical tension between the Christ of glory and the broken and desolate Christ on the edge of oblivion. But just before Toller can take his own life with a toxic glass of drain cleaner (a grotesque symbol of baptismal cleansing? ), he looks up to see Mary, standing quietly on the other side of the unfurnished empty space of his living room. When did she enter? Why has she come? “Ernst,” she says. It is the first time we have heard anyone speak his baptismal name. He’s always been addressed as “Reverend Toller.” But now, like Magdalene weeping at the tomb, he hears his name called by the tender voice of his “savior,” summoning him back from the dead. Without any hesitation, he sweeps across the room into her arms. As they embrace and kiss with unrestrained intensity, the camera, so still and quiet throughout most of the film, suddenly comes to life, circling round and round this miracle of redemptive love, like angelic praises whirling around the throne of God. This breathtaking perichoresis [xiv] continues without ceasing for a full minute, until it abruptly vanishes in a startling cut to darkness and silence. No lingering fadeout, just this sudden absence. Over the next bewildering 8 seconds, the viewer wonders whether the projector has broken. But then, the credits begin to scroll across the blackness, accompanied by the same low-pitched waves of mournful sound heard in the film’s bleak passages of environmental dread, as if to resist any presumptions of “happily ever after.” We may have glimpsed for a moment the miracle of saving love at the heart of the universe, but our fallen world still yearns in the dark. To me the last scene felt like something more than the natural outcome of the affinity we saw building between Ernst and Mary after her husband’s death. Reducing their union to a formula of movie romance would fail to perform the revelatory transit from the visible to the invisible. Schrader wants to give us more than a warm, familiar feeling. He wants to deliver the Wholly Other, who will not be contained by language or understanding. So Mary, pregnant with future, provides a surplus of meanings as she offers Ernst––and the receptive viewer––the divine embrace in all its forms: grace, mercy, forgiveness, peace, healing, hope, joy and the mystery of self-diffusive love. Its very unexpectedness is a sign of its sacred character. It is not something of our own making. It is pure gift. 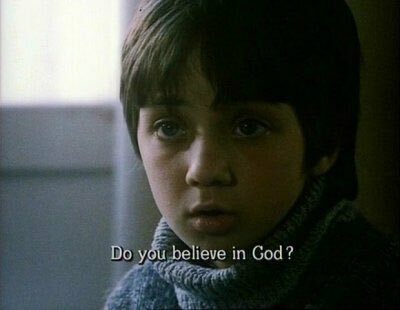 The essential function of spiritual cinema is not to structure a plausible narrative confined to the world we know, but to use the means of its form to create an experience of the life-giving sacred in the viewer’s inmost self. So whether Mary is the divine feminine, Dante’s Beatrice, an angel, a dream, Toller’s long-lost soul, or simply another one of God’s human children trying to connect, what does it matter? [ii] Devotions lxxxvii 17, q. in Helen Wilcox, ed., The English Poems of George Herbert (Cambridge: Cambridge University Press, 2007), 164. 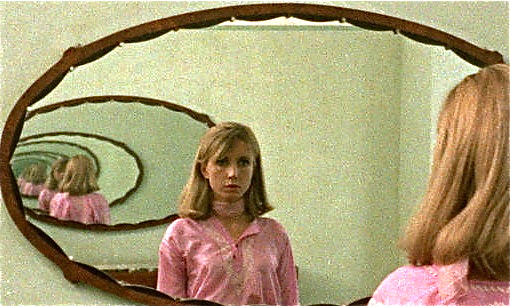 [iii] Paul Schrader, Transcendental Style in Film: Ozu, Bresson, Dreyer (Berkeley: University of California Press, 1972), 169. [iv] Robert Bresson, Notes on Cinematography, trans. Jonathan Griffin (New York: Urizen Books, 1977), 5. [v] Susan Sontag, “The Spiritual Style of Robert Bresson,” in Against Interpretation (New York: Dell Publishing Company, 1966), 180. [vi] Transcendental Style, 73, 75. [vii] In the film, the priest speaks these words in voice over as we see him kneel by the deathbed of a woman for whom he had been a vehicle of miraculous grace. [viii] Robin Wood, Ingmar Bergman (New York: Praeger, 1970), 111. [x] Christian Wiman, “Every Riven Thing,” in his collection of the same name (New York: Farrar, Strauss and Giroux, 2010), 24. [xi] Natalie Carnes, Image and Presence: A Christological Reflection on Iconoclasm and Iconophilia (Stanford, CA: Stanford University Press, 2018), 113. [xii] Schrader uses this line verbatim, and recreates the essence of Bresson’s scene, in his own film, American Gigolo (1980). [xiii] Jean Collet, q. in Joseph Cunneen, Robert Bresson: A Spiritual Style in Film (New York: Continuum, 2003), 82. [xiv] This Greek word for “dancing in a circular pattern” has long been used to describe the ceaseless movement of interpenetrating, self-diffusive love which is the Holy Trinity. Schrader’s image may be more carnal than most theology is used to, but that’s the price of the Incarnation! 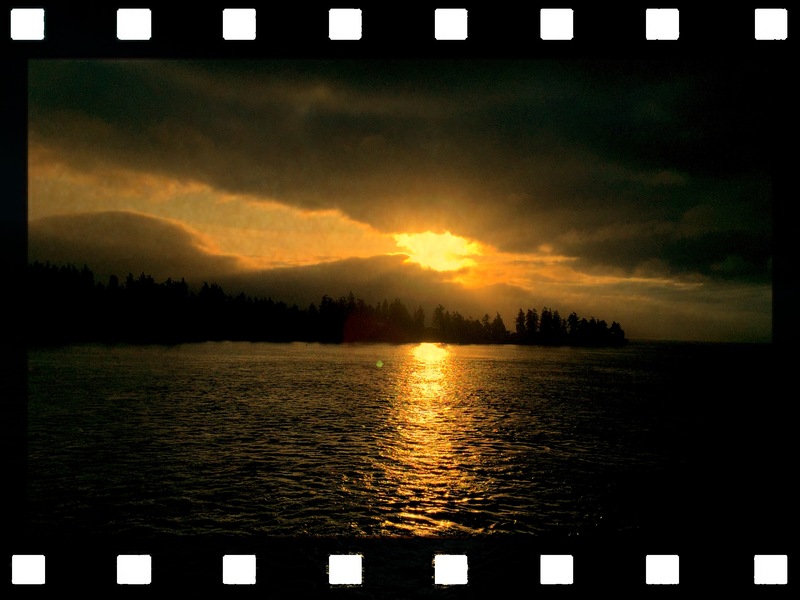 In Part 1 of Cinematic Resurrections, we looked at how Jesus films have represented the event of Jesus’ rising as well as the stories of his empty tomb. 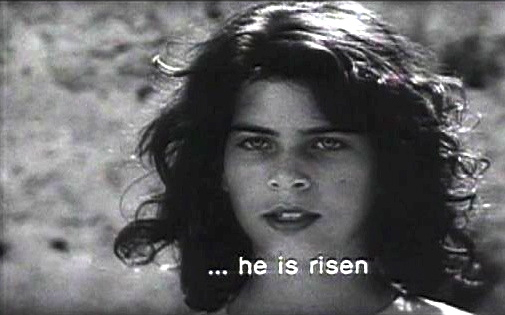 But the sensory appearances of the risen Christ present an even greater challenge for the filmmaker, involving a tension between visual plausibility and underlying truth. What really happened in the appearances, and what might that have looked like? In the gospel texts, these appearances are not presented as private, interior experiences, subjective and dreamlike. They always convey a sense of concreteness and physicality, experienced as something outside the observer. Jesus has a bodily presence which occupies the spaces of encounter. He still has human form, but something about him has changed. Catching sight of him is not enough to make the connection between the crucified teacher and this man from God knows where. Recognition is triggered not by his appearance, but by something he says or does, such as “Peace be with you,” or the breaking of bread at Emmaus (beautifully shown in The Miracle Maker). But even after the disciples discern the Risen One’s identity (“It’s Jesus!”), they still sense that something is different, something which begins to make them fall to their knees. It is hard to convey this sense of “same but different” on film when a single actor plays Jesus both before and after the resurrection. In King of Kings (1961), for example, it is still clearly the boyish Jeffrey Hunter, apparently unaffected by the harrowing passage through death into divine futurity, who meets Mary Magdalene outside the tomb. In Jesus (1999), the risen Christ has lost nothing of the California cool which Jeremy Sisto brought to his pre-Easter Jesus. Such scenes are all familiarity without the slightest trace of difference— it’s the same actor, the same affect, the same voice. Many of the films convey a sense of difference in the way the disciples respond to the appearances. When Jesus comes into their midst, they do not resume their accustomed rapport with their old companion of the road. They don’t rush to embrace him as you would a long-lost friend. They are respectfully hesitant to approach. Is this fear of the uncanny, or is it the beginning of worship? Then they move from astonishment and wonder to a place of prayerful receptivity. They bow their heads or close their eyes as Jesus speaks to them, touches them, or breathes the Holy Spirit upon them (as in The Gospel of John). The risen Christ soothes the anxious heart. Peace be with you. How far can a film go in representing a resurrection appearance? Whar are the rules of engagement for the visual artist? Son of God (2014) attempts to communicate the strangeness of the Resurrection in two interesting scenes. In the first, we follow Magdalene from the glare of the Middle Eastern sun into the darkness of the tomb. As she puzzles over the grave cloths, the camera shifts to reveal the tomb entrance, and there is Jesus, just outside in the bright light of day. Since the lens aperture is open wide to compensate for the dimness of the cave, the figure standing in the sunlight is extremely overexposed. The details of his face and body are burned out, erased by intense luminosity. This is not a special effect added to the image in post-production. It is simply how a camera sees under those conditions. With the cinematic eye calibrated to the darkness of death’s realm, we are literally blinded by the light. So Mary sees, but does not recognize, until Jesus speaks her name. “Teacher?” she answers, hesitant but hopeful. Then her face tells us— she knows him. But the distance between them remains: she in the tomb, Jesus in the light. “Go and tell the others,” he says. “I am here.” Then he turns to walk away, and after a few steps his figure vanishes into the white light. The encounter feels both plausible and strange at the same time. In this world but not of it. It has the naturalness of story, something which might have happened that way, but also the transcendent otherness of an icon. It’s only a movie— the artifice of representation using actors, camera and music, but it has the capacity to draw the viewer into effective proximity to what is being represented. Then, the same film gives us an upper room appearance scene unique to the genre— an audacious attempt to bridge the ineffable transition from physical presence to sacramental presence. Once the sensory appearances of Jesus ceased not long after the Resurrection, the eucharist became the tangible and revelatory sign that Christ is now present in all times and places. This scene creatively depicts a single presence behind both experiences. They run into town, pick up bread from a street seller and take it to the other disciples, waiting in the upper room. “I need a cup,” Peter cries. “And some wine.” Thomas, bewildered by Peter’s excitement, asks what happened. Peter doesn’t reply. There’s no time to waste. Jesus just smiles, and begins to walk around the table, pausing to lay a hand of blessing on each disciple. In the gospel stories of the upper room, Jesus speaks the words, “Peace be with you,” but here his wordless gesture says it all. When he reaches Thomas, he sits down to face him. Jesus shows him his wounded hand, and then gently caresses the doubter’s cheek with it. Love becomes the evidence Thomas has been longing for. Like Luke’s Emmaus story, this film scene blends narrative and symbol. Is it describing an original and unique appearance of the risen Christ, or is it representing the common experience of every believer who shares the bread of life and the cup of salvation? I would say both. What happened then, happens now. What happened there, happens here. And whatever the nature of the first resurrection appearances, those stories are deeply flavored by eucharistic practice. When the lector, deacon or presider says the words, Jesus speaks. When the bread is shared and the wine poured out for many, “he’s back.” And whenever two or three gather in Christ’s name, the peace which passes all understanding is bestowed all over again. As it was in the beginning, is now, and will be forever.